by Michael Bradshaw ~ image courtesy of Hawke ~ For more than 13 years now Gavin Hardkiss has been making the global underground swoon with psychedelic breaks, plucked from memories of his native South Africa and from beneath the streets of San Francisco. Hardkiss has spearheaded dance music for decades, wooing the weary-hearted with the sweet sounds of what he calls, “positive subtraction.” His latest album, Love Won Another—dedicated to his new(ish) daughter—is a delicious array of such positive-thinking delicacies which leave the listener chasing melodies like a child running with a butterfly net through an endless, pastoral springtime. Hardkiss spoke to phocas.net about the new album, being a rock star DJ, and family life. Love was released the day of the summer solstice this year and features collaborations with the likes of Steve Miller Band original guitarist David Denny, Earth Wind and Fire back up singer, “Maestro,” as well as legendary Michael Franti guitarist, Jay Bowman. Hardkiss invited musicians to his Calistoga retreat in the hills of the California, Napa Valley where they divided their time between harvesting fresh olives, crushing grapes with their bare feet and generating Love’s unique, musical universe. The project took two years to complete and was culled from sessions not only with a variety of musicians but friends, lovers and other artists who visited the retreat. Of the retreat itself, Hardkiss said it serves as a place where he, his wife and his new daughter can bond as a family unit and make beautiful music. As an accomplished producer, DJ and co-founder of the legendary Hardkiss record label, the name Gavin Hardkiss (AKA, Hawke)is synonymous with the global electronic dance scene and has been so since the early nineties. With releases in Spain, France, Italy the U.K. and U.S., Hardkiss is credited as one of the founding fathers of the San Francisco rave scene. 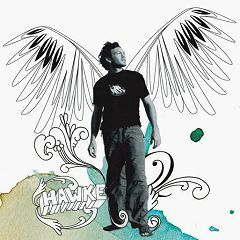 With three full-length albums under his belt, both Hawke and Hardkiss are content to kick back in unified bliss and enjoy the splendors of peace, love, music and family. This unification, it seems, has paid off. If it was indeed Gavin Hardkiss/Hawke’s goal to conjure up an esoteric world of sound with Love, then he has succeeded. Track for track, it moves with the continuity of a good concept album. However, if it is flawed in any way, it is due to an over abundance of balance. Although the fourth track, “Monkey’s Wedding,” offers some contrast, by and large the album plateaus on one vibe and rides it through to the end. The good news is, said vibe is a positive one and should be regarded with the same consideration as, say, Sacre bleu by Dimitri From Paris or the early work of Dub Tribe. Point of fact, Hardkiss said Love is a departure from other music being produced today in that it promotes an indiscrete message of positivety. The title track states, “Raise your hands to all the loving / All you people are still living / Now’s the time for rejoicing / You’re young.” This brand of youthful optimism resonates throughout. “I wanted to make something that a lot of different age groups and interests would get into,” Said Hardkiss. Hardkiss said his future is paved with more musical projects as well as family matters. He’s already working on his next album and said despite all his work as an internationally renowned DJ, he is most proud, in musical terms, of the work he’s done in the studio. Some of his more famous releases, such as “3 Nudes in a Purple Garden,” are considered some of the most influential tracks of all time. His DJing has carried him around the world however, it’s his album compositions such as “Love Won Another” and the prospect of family Hardkiss said, which are the biggest things in his world. Hardkiss/Hawke invites phocas.net readers to listen to Love Won Another at his website, GavinHardkiss.com.